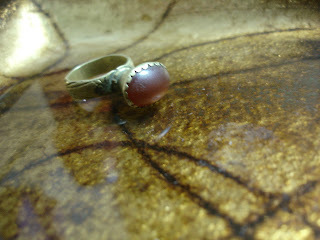 This Ring is over 300 years old and was found among buried treasures found in North Afghanistan, it is made of a blend of silver and melted down coins it holds a Carnelian from yemen which were prized by kings and Noblemen in the east, it has a beautiful patina, and it shows its age. Bound to this vessel is a Generous and heartful Marid Warrior! He belongs to a noble royal army that has actively been battling the Dark forces for thousands of years, he has reached a high rank through his own merit. This djinn warrior is among the powerful djinn tribes that I only offer.